AJ is a tried and true, Full Peruvian, non-fading black macho. His fleece is soft (2000 micron of 18, 2007 MICRON, 22.0, SD 4.5, CV 18.6, >30 4.2 !!! ), crimpy, and virtually free of guard hair. 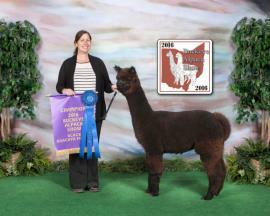 He has proven himself in the show and with his progeny. 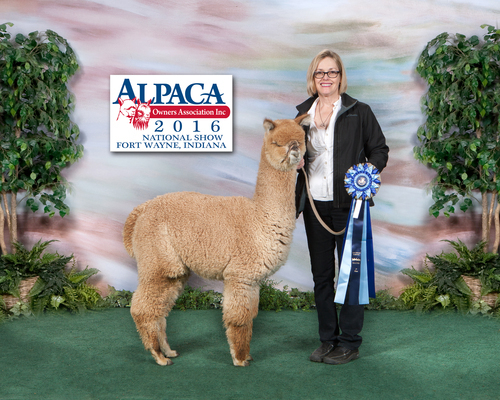 A four-time Reserve Champion, AJ has also won more than 20 blue ribbons for halter, composite, and fleece including a blue ribbon fleece award at AOBA. AJ won the coveted Get of Sire against two white, highly competitive males - very rare for a black. 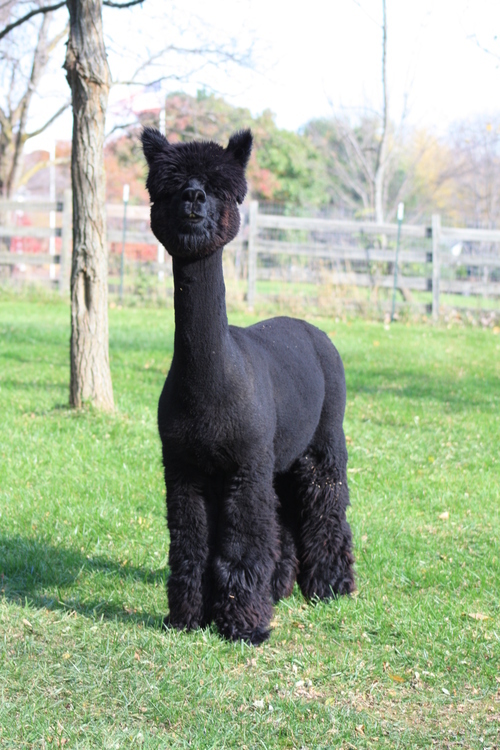 THE COLOR MASTER AJ has over 96 crias on the ground, all are black or brown with one silver grey out of dams from silver to white to black – color is no problem for this boy. 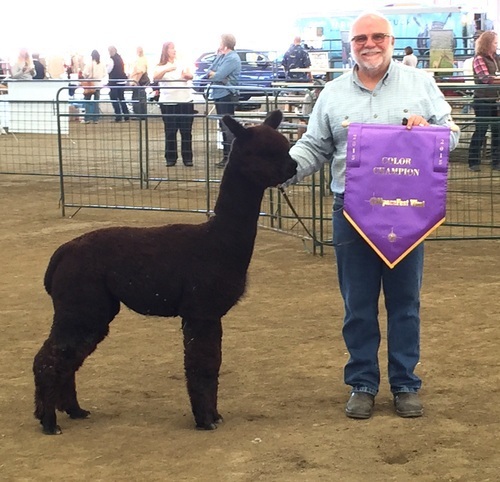 Many of his crias are already in the winners circle garnering first and second places as well as champion and reserve champion awards for halter, fleece, shorn, and composite. Stunning Reserve Champion medium fawn female out of a blue ribbon fawn Titan daughter. .
Kodiak is an amazing full-Peruvian, true black male. He boasts some impressive bloodlines, sired by the respected CPeruvian Axion Jaxon and with 6Peruvian Accoyo Titan and Accoyo Camilio on his dam's side. Axion Jaxon has over 96 crias on the ground, ALL are black or brown with one silver grey out of dams from silver to white to black. Kodiak is just packed with color in his genes! Kodiak is not just a pretty pedigree, his phenotype is exceptional too. Kodiak is straight, compact, has substance of bone, and a gorgeous head with incredibly fuzzy ears. His fleece is exceptional. It is well above average in density and admirably fine. It is very hard to find this quality of fleece in jet black! His well-organized fleece is just a delight to touch, come out and see for yourself! 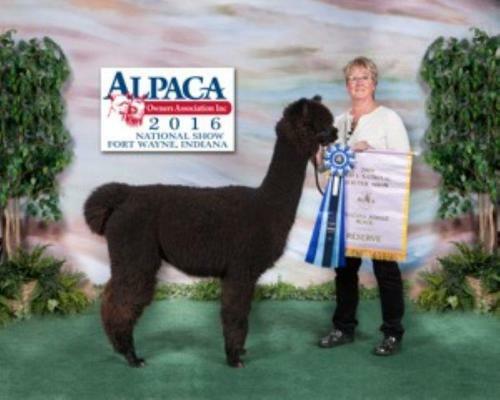 co-owned with Blue Ridge Alpacas & SkyFiber Alpacas. 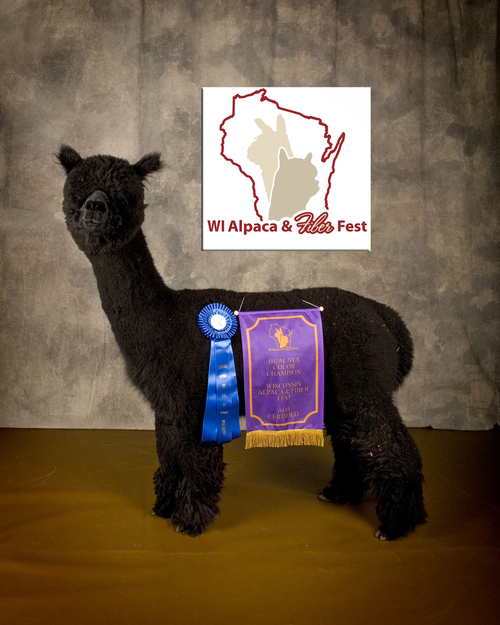 Kodiak will be at Blue Ridge Alpacas in WI July-November, SkyFiber Alpacas in VA November-April and DG Alpacas in OH April-July. 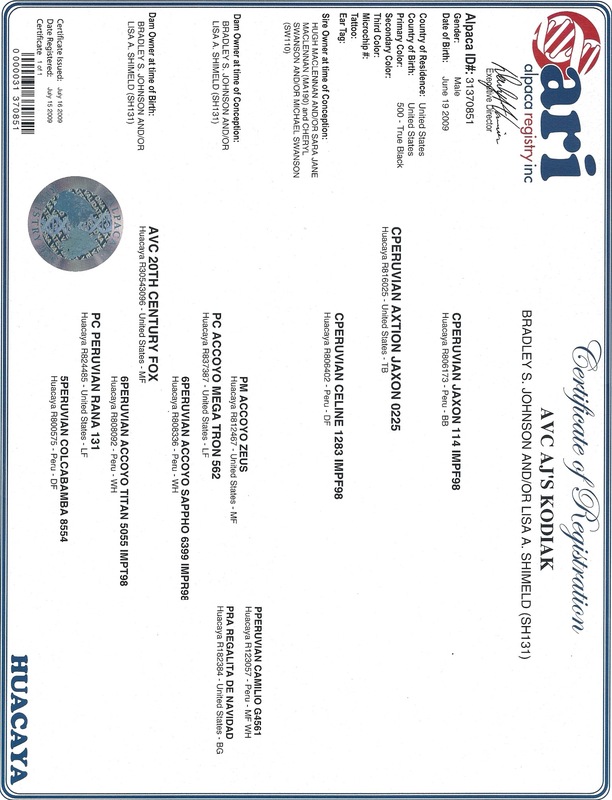 We offer many creative plans for financing. Contact us for a personalized finance plan.